Normalizing Relations between adversary nations leads to diplomacy and understanding. In 1972 President Richard Nixon took a dramatic first step toward normalizing relations with the communist People’s Republic of China. In 1985 Reagan saw Mikhail Gorbachev as a viable negotiating partner. In 1989 the Berlin Wall fell. By the end of 1991, the Soviet Union had dissolved. The normalization of relations between the United States and adversary countries tends to lead to diplomatic change and a working relationship that mutually benefits both countries. For Jeb Bush and Marco Rubio to not recognize this reflects an ignorance of international relations. Change can only come about through communication and understanding. As part of the exhibition “PLAYING WITH FIRE: Political Interventions, Dissident Acts, and Mischievous Actions” at El Museo del Barrio several interviews were conducted with the artists concerning their practice. Below is the interview that the curator Nicolás Dumit Estévez conducted with me for the exhibition. The exhibition continues on view until February 7th. NDE: Can you talk about the use of firearms in On Transmitting Ideology? RMZ: Through the amplification of mass media, ideological rhetoric is a powerful cultural weapon. I wanted to make as transparent as possible the power of ideological speech and its transmission through the media; mounting the radios on to the forms of AK47s and Uzis immediately triggers this link – the transmission of ideological speech is a political weapon. NDE: I had the opportunity to see images of the performance of On Transmitting Ideology in Berlin, Germany. What were some of the reactions from passersby? My understanding is that people in the streets encountered you, as well as a small cadre of performers carrying wooden AK47s? How did you go about recruiting participants to your piece? RMZ: The march was one act of a 24 hour sound performance titled “Moving Forest” that was commissioned for “transmediale.08: CONSPIRE…” an annual art and digital culture festival in Berlin. The performance and call for participants was circulated during the festival, so it was festival participants that volunteered to be part of the performance. The march of 20 participants was from Haus der Kulturen der Welt to the public park Siegessäule with a stop by the mayor’s home. My constant fear was that of authorities stoping us, but police merely looked at us with disinterest. Also most pedestrians merely paused to watch us, some asked what we were doing and when English speaking, we had them listen to the audio montage. People who did so, generally understood the work and were only surprised by the extremism spoken in the historically famous speeches. NDE: There is a great deal of debate between those who advocate for guns and those who want to ban them . I am wondering how On Transmitting Ideology may or may not position itself in the context of this push and pull. RMZ: The representation of the gun is to reflect the violent nature of ideology and if one is to listen to the audio montage, it capture extremism. I consider both violence and extremism as negative characteristics of society. The reading of the work that is most in line with my goal in creating the work is that we as a society need to move away from both weapons and ideological extremisms – political and religious. NDE: What are your thoughts about the politization of aesthetics. It has come to my attention that, while it is fashionable to make “political” work, politics are not a hip subject in the art world? RMZ: I have little interest in the art world. I’m much more interested in art that exists outside of the art world; art that engages people who are not seeking art and may function outside the gallery or museum. I’m interested in art that attempts to weave itself into the fiber of everyday culture while investigating, questioning and perhaps critiquing normative culture to stir self reflection. Much of the exchange in the art world is to decorate the homes of the wealthy or perhaps to serve as an investment for the wealthy. Perhaps for the art collector, investing in work that portrays current day politics is a bad long-term investment choice and not the best home decoration. If art world work is political, it needs to be sufficiently abstracted or undefined to function as a commodity object, so that any political potential has been muted. NDE: Making political art work entails a big responsibility and a challenge as well. How can art that is politically-conscious live beyond the art world and effect change in society at large? And is this the role of the artist? RMZ: This is a tough questions, because I don’t know how one would measure the effect of politically charged work upon others whom it may inspire to act. I believe that as long as the drive to create political art is sincere – that the artist is compelled to make political art due to first-hand experience of injustice, inequality, the misuse of power, it is not the role of the artist to effect change. The role of the artist is to capture and convey. This interview is part of Crossfire, a project conceived and edited by Nicolás Dumit Estévez for El Museo del Barrio. 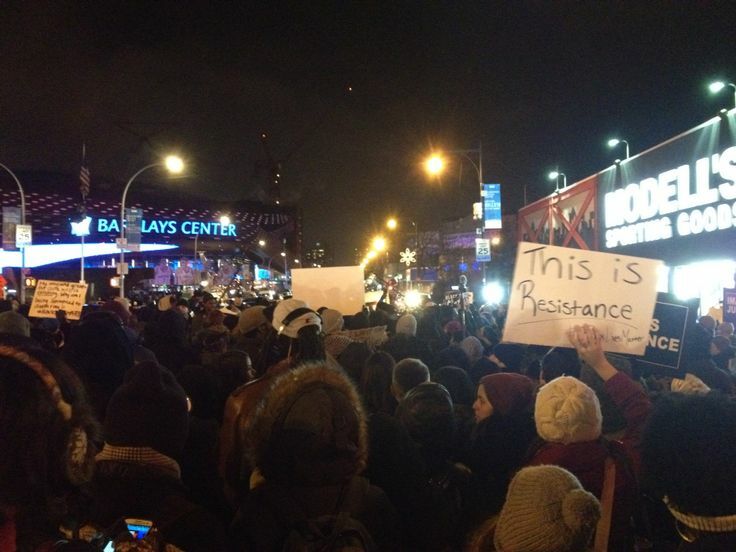 Regular people marched from Barclays Arena in to Flatbush Avenue down to Atlantic and circled around the intersection of Atlantic and Flatbush ahead of the Cavaliers and Nets game. It was a tremendous showing by people of all races and ages. Never imagined I would see the intersection of Atlantic and Flatbush entirely shut down. People peacefully marching and claiming our streets. “Every Mother’s Son” profiles three New York mothers who unexpectedly find themselves united to seek justice and transform their grief into an opportunity for profound social change. The film opens with the death of Anthony Baez who died due to a choke hold by Officer Livoti, at times it feels as if little changes in our society.